Home » History » What Was The True Shape Of The Ancient Armenian Crown? What Was The True Shape Of The Ancient Armenian Crown? Hi guys, I need your help with something. You see, I’ve been wondering about something for a while now and I still cannot make up my mind. So I thought to myself, who to ask better than the well observant visitors of this blog?! Make sure to read the entire article though before you vote in the poll! It might seem an easy question to answer since there are quite a few depictions of this crown from various (ancient) sources. You might have even seen it in several of my earlier posts like “The Armenian Crown“, various posts I made about the ancient Armenian king “Tigranes the Great” or the “image of Armenia on Roman coins” that shows how important that crown was as a symbol of Armenia. But I am honestly stuck between two most likely possibilities for the true shape of this crown and I will tell you why in a moment. For the lack of better terms I will use the closest geometrical terms familiar to me to describe these shapes. Basically a “Triangular prism” or a “Cylinder” -shape. The crown we are talking about here, is the most iconic ancient Armenian crown also known as an Armenian Tiara, worn by several Armenian dynasties especially those of the Artxiad family. Because the coins of Tigranes the Great and other members of the Artaxiad family are always showing the monarch from a profile view, there is no way of telling if the crown is meant to look cylindrical like the classic European medieval crown or like a triangular prism with a broad bottom and a narrow top. Luckily there are other ways we can investigate this issue with. To let you in on my thought process I’m going to make two separate cases with arguments supporting both cases separately and I will ask you to examine both cases and decide which one you think is most probably correct. Now I’m going to be honest with you and I’m telling right away that I am biased. Namely towards the Triangular prism shape, but I still cannot definitively decide because ironically the literature more often than not supports the cylindrical shape. To add to that most of the reconstructions and the work of modern artists are also showing a cylindrical crown. So I was hoping we could decide together. Please take the time to read through this post before you voice your opinion. Lets start the cases! First we need to understand that the classic European cylindrical crown that we are so familiar with today was not a given in the ancient world. In the classical antiquity royalty wore many types of headgear usually a wreath, a chaplet, or ribbon called a diadem. The precursor to the crown was such a browband diadem, which had been worn by the Armenian and Persian kings, was adopted by Constantine I, and was worn by all subsequent rulers of the later Roman Empire. While some royal headgear of the ancient times had solar rays emanating from them, it wasn’t that common of a practice. The corona radiata, the “radiant crown” was worn by Roman emperors only as part of the cult of Sol Invictus prior to the Roman Empire’s conversion to Christianity. The Armenian Tiara can also be considered one of the precursors of the modern European crown. So if we consider that the classical European type of royal crown was not the model royal headgear of the ancients, we understand that royal headgear could have had many different shapes at different times in different regions. Now let us examine the evidence. Antiochus I Theos of Commagene is depicted on his coins wearing exactly the same Armenian crown with the Artaxiad coat of arms displaying his Armenian lineage, as did Tigranes the Great of Armenia (see coin comparison bellow). As it so happened to be Antiochus I also left numerous monuments including (large) statues of himself wearing the Armenian crown at the mount Nemrut tomb-sanctuary. And this is where it gets interesting, because the shape of Antiochus’s crown is clearly that of a triangular prism (see images of the colossal head of a statue at mount Nemrut bellow). Notice that on these statues, unlike on the coins Antiochus I has the ear-covers (earflaps) lifted and bound across the forehead covering his diadem. 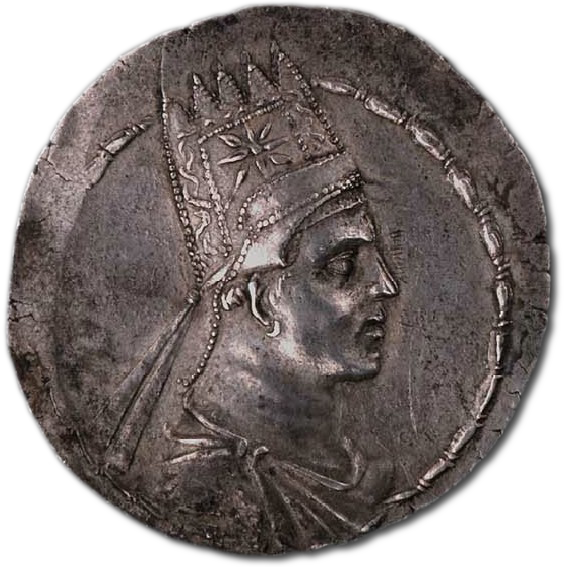 We see the Tiara being worn the same way by Artavasdes II of Armenia (son of Tigranes the Great) on his coins. Click HERE and HERE to view the coins of Artavasdes II. In case the above images don’t suffice lets look at the following 360 animation of the head of the statue of Antiochus I Theos of Commagene. At the same site at mount Nemrut Antiochus I also left several life size wall carvings of himself shaking hands with various Gods. Even though these carvings are a profile view they still have enough relief to distinguish the shape of the crown, see images bellow. Archaeologists also found a smaller statue of Antiochus I there. Just as in the other statues we observe that the crown is shaped like a triangular prism. The statues of Antiochus I of Commagene serve as our main evidence for the triangular shape of the ancient Armenian tiara. 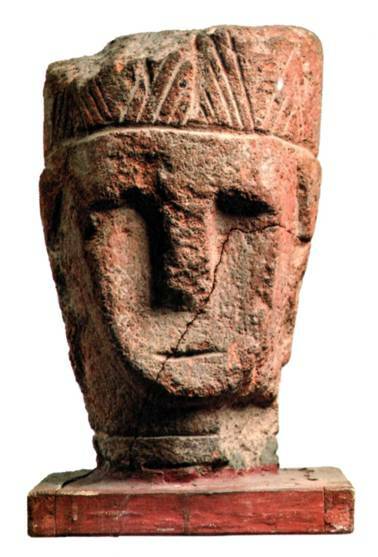 Other clues however come from various artifacts found in Armenia and other regions representing Armenia. 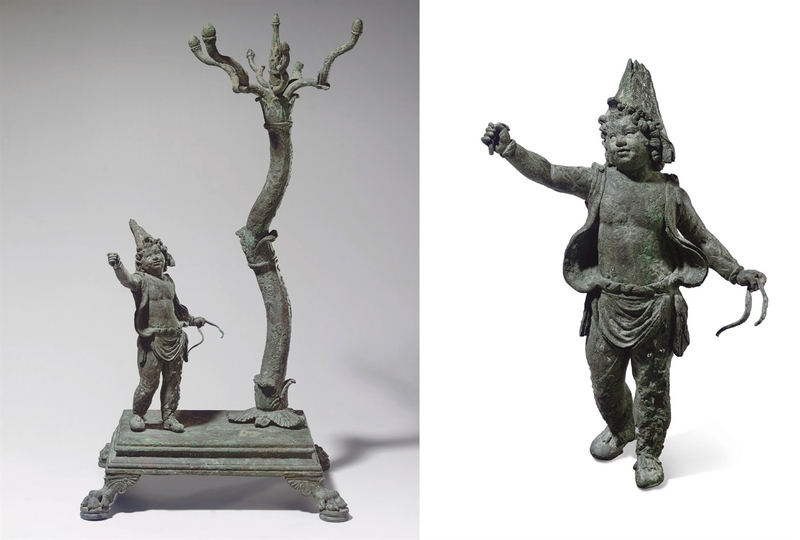 The Metropolitan museum of arts possesses a very interesting artifact depicting a boy in “eastern” dress, which is a term signifying the east of the Greco-Roman world. Most probably the boy represents an Armenian prince. We observe him wearing such an Armenian Tiara, or something that suppose to resemble an Armenian tiara. The Metropolitan museum identifies the statues (along with another similar twin statue) to either represent two Armenias (Armenia Minor and Armenia Major) or a portrait of Alexander Helios, son of Mark Antony and Cleopatra VII, as prince of Armenia after Mark Antony’s conquest of Armenia in 34 B.C. (read the official description here). 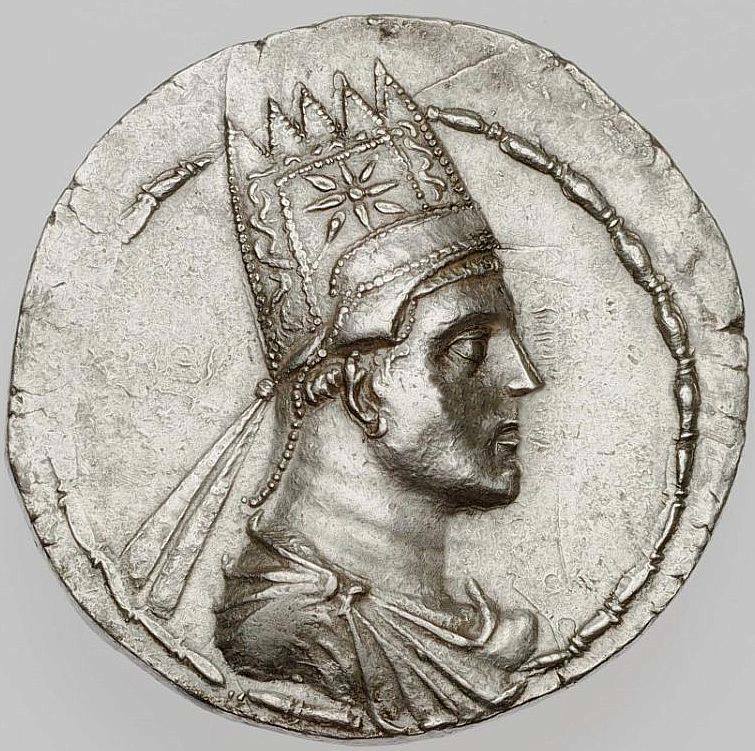 In any case the statue refers to Armenia and as often in the Roman world the Armenian Tiara was an important symbol of Armenia (see images on roman coins). We observe that, here, too the headgear is shaped like a triangular prism (see images bellow). Bronze statuette of a boy in Armenian dress, 1st century B.C. Roman statue (from a lamp) of a boy in Armenian clothes, 1st c. BC. Yet more proof comes from occasional findings within the borders of the modern Republic of Armenia. 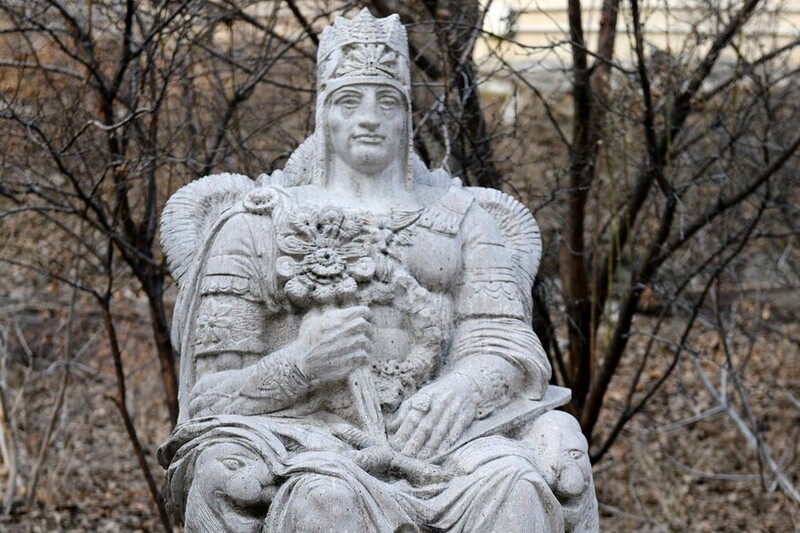 See bellow a statue probably of an Armenian (Artaxiad) royalty excavated in Shirak. The statue itself is not life size (the background in the image shows the archaeological site where the statue was excavated). Although this is of lesser value as proof of the triangular prism-shape of the Armenian tiara, I still think it shows quite a good profile of a tiara shaped as a triangular prism. I think if the tiara would have been cylindrical it would have been depicted differently. We can clearly see the shape of the headgear going from wide to narrow at the top and we do not see the rays of the crown from the opposite side. There is a Roman coin that shows the crowning of an Armenian king Artaxias where the Armenian tiara is shown from the front instead of the usual side-view, which shows that the Armenian crown is shaped like a triangle as opposed to a cylinder. 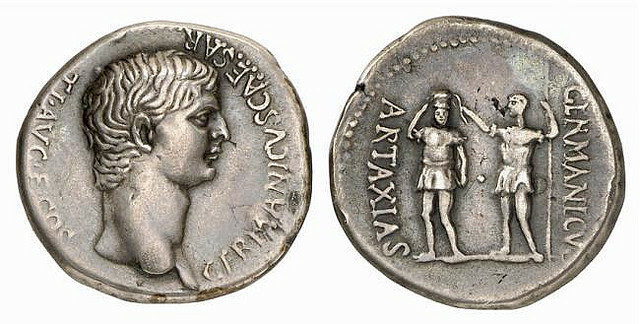 See bellow the coin titled on the reverse: Artaxias – Germanicus, showing Germanicus placing the tiara on the head of Artaxias. Germanicus crowning Artaxias by placing the Armenia Tiara on his head. 15 BC – 19 AD. These doings were all known to Germanicus; but his more instant care was, to visit Armenia, an inconstant and restless nation from the beginning, from the genius of the people, as well as from the situation of their country, which, bordering with a large frontier on our provinces, and stretching thence quite to Media, is inclosed between the two great Empires, and often at variance with them; with the Romans through antipathy and hatred, with the Parthians through competition and envy. 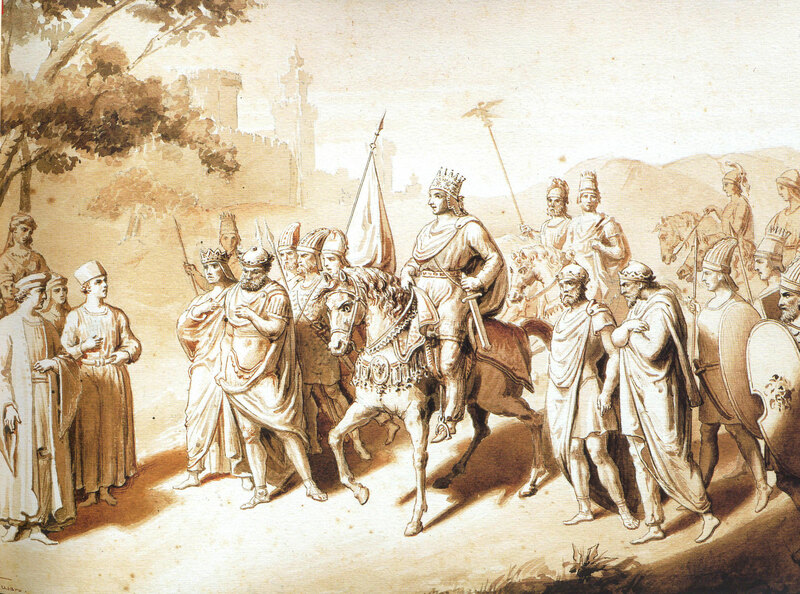 At this time, and ever since the removal of Vonones, they had no King; but the affections of the nations leaned to Zeno, son of Polemon King of Pontus, because by an attachment, from his infancy, to the fashions and customs of the Armenians, by hunting, feasting, and other usages practised and renowned amongst the Barbarians, he had equally won the nobles and people. Upon his head, therefore, at the city of Artaxata, with the approbation of the nobles, in a great assembly, Germanicus put the regal Diadem; and the Armenians doing homage to their King, saluted him, Artaxias, a name which from that of their city, they gave him. Notice also how Tacitus lists the practice of “hunting” and “feasting” as popular cultural practices of Armenians. 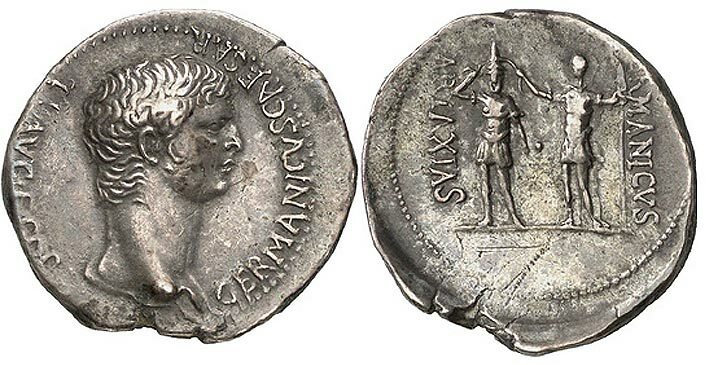 To confirm that this is not some defect in the coin see bellow another coin of Germanicus crowning Artaxias with the same triangular tiara placed on his head. Other Roman coins also seem to depict triangular crown on Armenian royalty. When the Roman emperor Trajanus conquered Armenia, Mesopotamia and Parthia he commemorated it on his coins with a figure of Armenia laying at his feet. 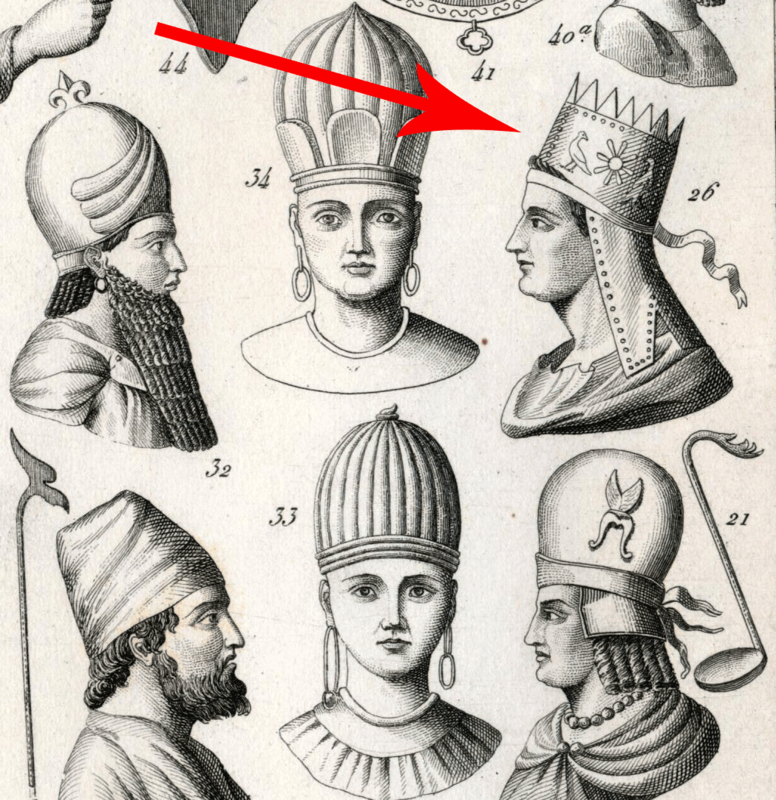 The image of Armenia is wearing a triangular shaped tiara it seems (see images bellow). Trajan in military attire standing, head r., holding spear and parazonium, at his feet are the reclining figures of Armenia, Euphrates and Tigris referring to annexation of Armenia. Trajan in military attire standing, head r., holding spear and parazonium, at his feet are the reclining figures of Armenia, Euphrates and Tigris referring to annexation of Armenia (1st century AD). So case closed! Right? Well not quite! Don’t agree with me just yet, read the next case and then really think about it before you make your final decision. Now that you have read case one, let us examine some of the evidence we have for the cylinder shaped crown. We’re going to start this case off with some references to experts. It seems that an overwhelming majority of experts be it scholars or artists describe and depict this crown as a classical European style cylindrical shaped crown. 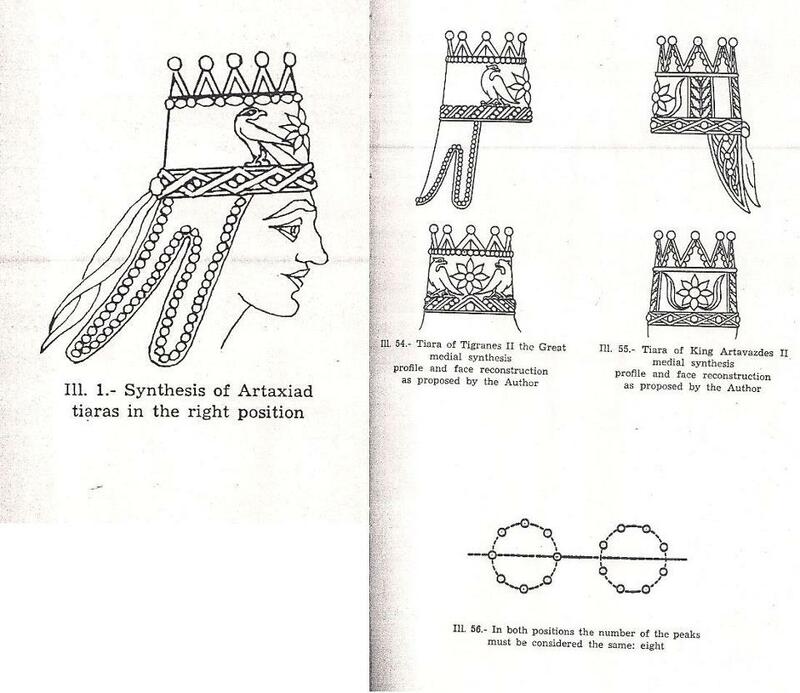 For instance bellow is an anatomy of the Armenian tiara described by an art historian Hayk Ter-Ghevondyan in a journal published in the 80ies. We can clearly see that even the top view shows a circular form. Other reconstructions and illustrations from various sources also show a similar cylindrical shape of the tiara (see images bellow). 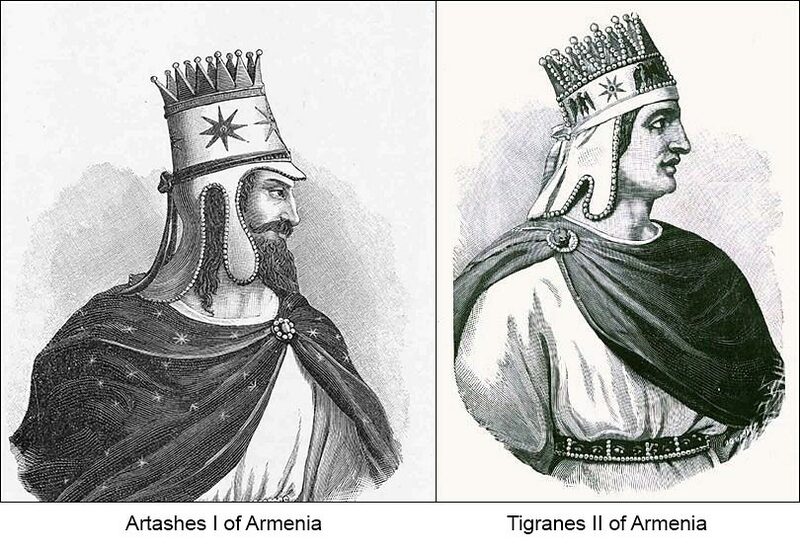 The Artaxiad family and especially Tigranes the Great has become a popular recurrence in Armenian books, artwork and generally in Armenian culture. If we look at the illustrations in artwork, statues, entertainment etc… we nearly always see Tigranes wearing a cylindrical crown. See some examples bellow. There are even depictions of Tigranes on commemorative coins, medals, awards and so on. The overwhelming majority of these depictions again show a cylindrical crown (see bellow). 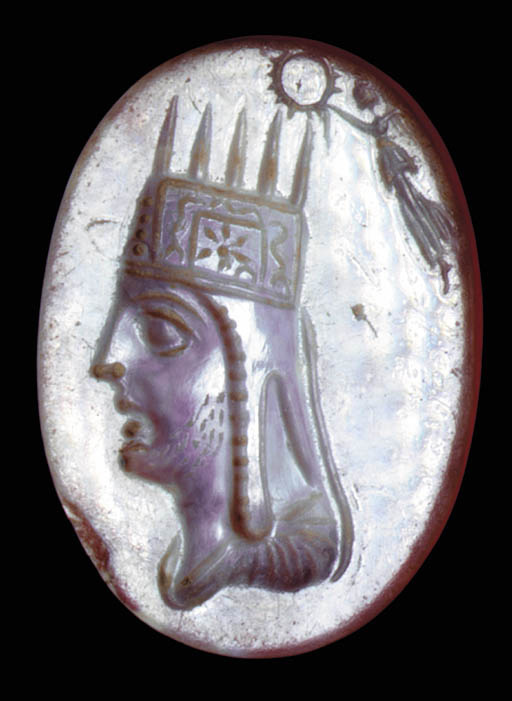 Now that we’re clear about the fact that in popular culture Tigranes II is almost always depicted with a cylindrical crown, let us look at some evidence from a more distant past. 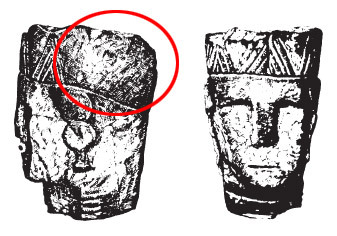 Maybe the most compelling evidence for the “cylindrical” shaped crown comes from a set of ancient statues found in several places in Armenia. These statues seem to depict noblemen or royalty. Some of the statue heads have something on their heads that closely resembles a crown. The shape of which is also clearly cylindrical. See images bellow. (NOTE: The dating of these statues is controversial, read the Concluding remarks section for an explanation). 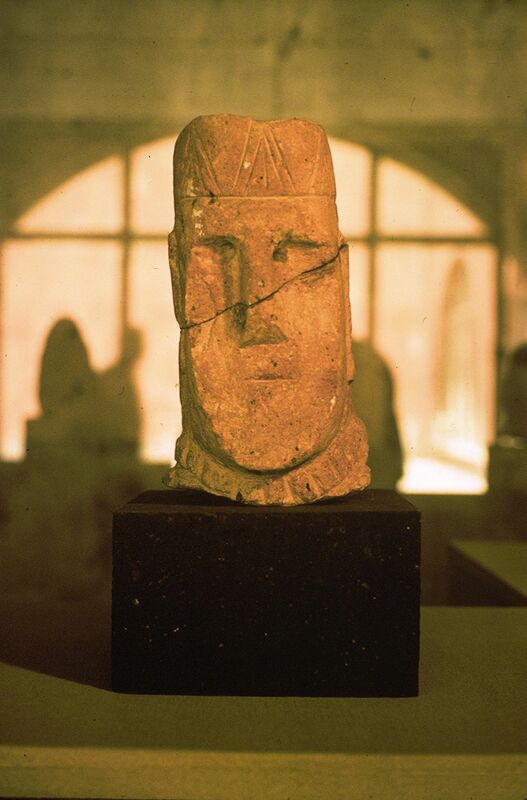 Male statue head, excavated in Dvin (dated either 9-8th c BCE or 1st c. BC). The shape of the first and the last ray on Tigranes’s coins suggest a curvature. We see on most of his coins that the first and the last rays on the crown are half rays, which indicates that they are folded in a curve. 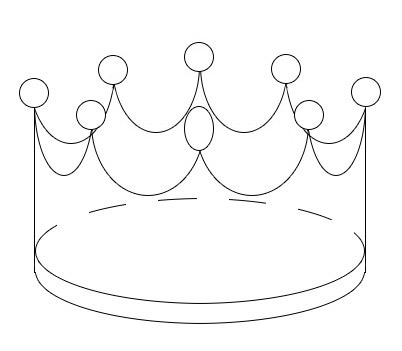 This could be an indication of a cylindrical crown. Coins of Tigranes with the first and the last rays of the crown suggest curvature. Some coins also seem to show rays on the backside of the tiara which would suggest a cylindrical shape. Coin of Tigranes and Artavasdes seem to show rays on the backside of the crown suggesting a cylindrical form. Some Roman coin also seem to depict a cylindrical shape. Does the bellow coin show a front view of the Armenian tiara? Notice two bands on the side. Roman coin with the inscription: Armenia Capta, Augustus, Struck 19 BC. And finally if we return to the last argument from Case 1, we can challenge it with an argument for Case 2. In the last argument for Case 1 we argued that a Roman coin showed Artxias crowning from the front side showing a triangular shaped tiara. But in another coin from the same source we see a cylindrical shaped crown being placed on Artaxias’s head (see examples bellow). To add to that, a reconstruction, in a book about ancient coins, also seems to show a cylindrical crown from the front side (see image bellow). In conclusion I want to say that I personally find most of the “evidence” for the cylindrical shape quite weak. I already mentioned that my personal opinion is that the shape of the ancient Armenian tiara was a triangular prism, yet I am still not 100% sure. I say this because the most compelling ancient sources show a triangular tiara on kings with Artaxiad ancestry. The most compelling of which being the statues of Antiochus I Theos of Commagene who clearly affiliated himself with the Armenian royal lineage. The evidence for a cylindrical shape are quite scarce and weak indeed. First of all the fact that experts and artists depict a cylindrical shape is no proof of accuracy at all. It’s their (artistic) opinion without much of historic basis if any at all. All the other evidence including depictions on coin that seem to indicate some form of curving tiara are very weak as well (Antiochus’s coin also shows the same art style while his statues clearly show a triangular tiara). 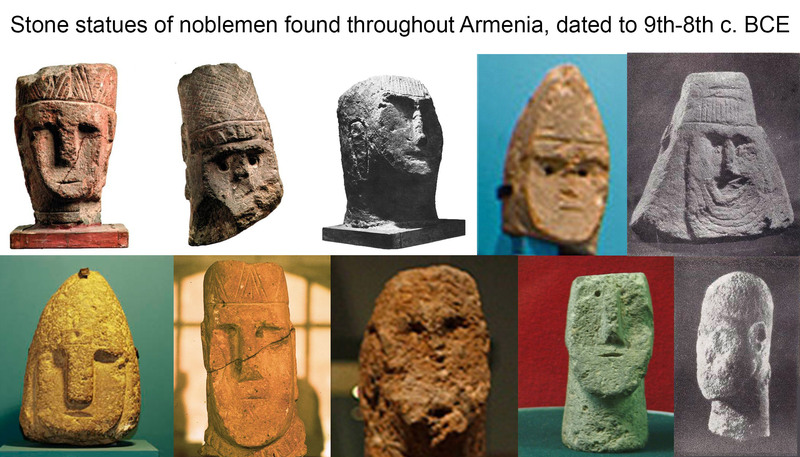 The only historic “evidence” for the cylindrical shape argument seems to be a series of heads carved from tuff-stone found throughout Armenia. But the problem with those heads is that they neither show a full Armenian tiara nor seem to be contemporaries of the Artaxiad lordship. While previously they were dated to 1st. century BC., the Armenian History Museum has since (after extensive research) changed the dating to the 9th-8th century BC. Which would predate Artaxiad lordship, thus excluding the possibility that they depict the Artaxiad tiara. Besides, a side-view of these statues quickly shows that the rays don’t go all the way around the head (see image bellow), and thus, it doesn’t seem to support the idea of a full crown, more like some headgear with 3 rays at the front. What it exactly represents remains a mystery. Moreover, such statues are found with many different types of headgear, including some triangular once (see image bellow). They are most probably some sort of depictions of ancient Armenian noblemen. Thus we see many different types of headgear. It is difficult to say weather or not and how they relate to the Artaxiad crown we are talking here about. But obviously someone is wrong. Either I am wrong with the above analysis and the assumption of the triangular shaped crown or the experts/artists/historians have overlooked this issue for quite a while now. That is why I am hoping to get some input from you guys, to see which case is more accurate according to you. And if it is the triangular prism as I seem to think, then isn’t it high time we start making more accurate reconstructions in art, books, logo’s, on official medals etc…? Let me know what you think by voting in the poll above or in the comment section. Every input is welcome. I hope this was as interesting for you to read as it was for me to make. I’m excited to see what the poll results will be. Till the next post! Perhaps, a crown for different functions? Isn’t it possible there was more than one? I’m not a professional on the matter, but as somebody who only just got the gears turning, it makes sense to me that the royal family would have multiple crowns. And what about geographic differences? Is it possible that different regions had their own style? Just my two cents. Bt the way. 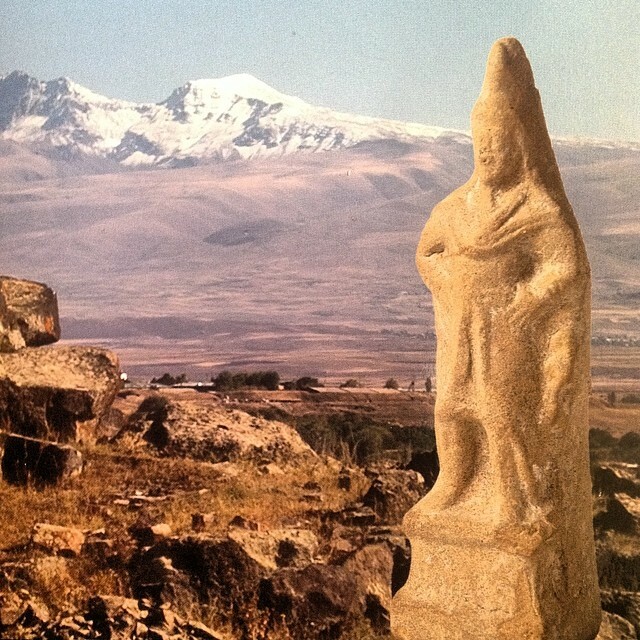 I’m gonna stick with the prism for now, especially since it’s the only one that has a 3-D depiction, Nemrut Ler. Awesome article! Grand Merci, c’est tres interessant, Վարձքերնիդ կատար,J’en suis tres fier d’etre armenien. I would like to publish this remarkable article in a scholarly journal and wish to contact you directly (but I do not have your email address). We have started a world wide Armenian Numismatic and Antiquities Society. We will post this article on our site. Our goal is to make contact, publish and educate the world regarding all the wonderful material of Armenian history. Please consider sending us your email so we can keep you posted on up and coming events, articles and research. Jack Nurpetian- we want to publish your research. Others also. It was between the two shapes. The tiara itself is a cylinder, of course, but at the top part it narrows (unlike other crowns, who normally broaden closer to the top). Still, the overall shape was cylindrical, I believe.